​It’s back to school time! And the parents of the world rejoice as they prepare to send their children back to school. Well, maybe they rejoice. There’s a lot to do to get ready for back to school. Luckily at LifeSong, there are some things you don’t have to worry about. For example, no shopping for school supplies when your kids attend LifeSong – that’s something the teachers take care of. No backpacks to prepare either. There are, however, a few things you may want to do to prepare yourselves and your children for back to school. Go ahead and set sleep schedules to back to school time. This means going to bed at the time your child normally does when in school and waking up at about the same time they do for school. You’ll probably find that this change in schedule will affect your schedule as well as that of any other children in the house. Starting now will help you work out any kinks as well as give you child time to adjust to the change. Speaking of bedtime, now is the time to work on bedtime routines. If you can establish a good bedtime routine before school starts, it will make your life easier when school starts. Think about things like what time the TV needs to be turned off, bath time, story time and what time you want lights out. The same goes for mornings. Do you allow TV time in the mornings before school? What tasks is your child responsible for in the morning before school, like maybe making his bed or helping to fix his lunch? Test your alarm clock(s). If you are not using your alarm clock now or maybe you just bought a new one, test it before school starts. Make sure you have the wake-up time set to AM (please tell me I’m not alone in having set an alarm only to find out too late I set it to PM instead of AM). The first day of school is not the day to find out your alarm doesn’t work or that you set it incorrectly. If your child will be bringing a lunch to school, make sure you have a lunchbox, ice packs and whatever containers you plan to put the food in. If their food will need to be warmed, we prefer glass containers that can go straight into the microwave. If you have a thermos to keep food warm, that would be helpful as there are days that the microwave tends to have a wait. You will also need to have a set of utensils dedicated just for school lunches (this is new this year!). Go ahead and wash everything and stick the ice packs in the freezer if they’re not already there. Oh, and don’t forget to label everything with your child’s name. Now everything you need to pack a lunch is ready for the first day your child needs a lunch. Now is also a good time to review the information in your parent handbook about what is allowed for lunch and what is not. Talk with your child about lunchtime at school. Let him/her help you decide what’s for lunch. If you haven’t done it yet, go ahead and go through your child’s clothes. Take out anything he/she can’t wear anymore and make yourself a list of what you might need to buy. It may be helpful to organize your child’s drawers or closet with seasonally appropriate, school appropriate clothes in the easiest to reach places. This is particularly helpful if you child dresses himself in the mornings and needs help remembering that, for example, the Star Wars shirt is not okay to wear to school. While you’re cleaning out the clothes, go ahead and pull out that spare set of clothes that will be left at school. Remember, put your child’s name on item. Then put it in a bag so it’s ready for the first day. Talk to your kids about what to expect when they arrive at school. This is especially important if your child is new to the school or tends to have anxiety about new or different situations. Be positive when you talk to him/her and be sure to tell emphasize that school is fun. We do allow parents to walk their child in on the first day. If you would like to do so, please park and walk them to the playground for Primary or classroom for Elementary. Let them know beforehand that you will walk them in, give them hugs and kisses, but then you must go. Assure them that you will be back to pick them up at noon. As soon as you see them engage with the other children, make your exit. If you want to watch them, do so from a vantage point where they will not see you. After the first day, we encourage you to drive through the carpool lane and let the teachers greet them and bring them in. We’ve had lots of practice and promise that if they have any separation anxiety, we will help them through it! Stage the things you will need for the first day of school in a place where you will see them, such as by the door. Go ahead and put them in the car if you need to. That means inside shoes, a full change of clothes and a water bottle – all clearly marked with your child’s name. There you have it, a few reminders of what you can be doing now to make sure you and your child are ready for the first day. It’s going to be an amazing year at LifeSong. We’re so glad you’re joining us this year, and we can’t wait to see all the smiling faces on the first day. When did you last surround yourself with silence? If you are like me, it has become something you savor as a mother. When you are surrounded by children as a parent or a teacher, it is a rare and special treat. Maria Montessori understood how important it is to teach an appreciation of silence, so she developed the silence game for her students. When playing the silence game, the children are taught not only to appreciate silence, but made aware that they can create it. The silence game can be implemented in different ways. There are as many versions as there are Montessori teachers. I have made a habit of making it a daily exercise in my classroom. Dr. Montessori said, “Children are not only sensitive to silence, but also to a voice which calls them … Out of that silence”. The silence game is used to instill a sense mindfulness. It takes great self-control on the part of the children and is accomplished as a collective group. I start this exercise early in the school year, as soon as the class begins to demonstrate some control of movement. We talk about silence, what it means and how we, ourselves, can create it. I have them listen. I ask them, “If we sit very still and very quietly, what can you hear?” The next day I tell them that we are going to play a special game that was created by Maria Montessori especially for her class. In order to play, we make ourselves absolutely still. I ask, “can you sit without moving a muscle?” I tell them as soon as we make our bodies still we will create silence. Dr. Montessori states in The Absorbent Mind, “perfect silence can only be obtained if all those present are willing. A single person can break it. Success therefore depends on conscious and united action. From this comes a sense of social solidarity.” We start with very short increments, like five or ten seconds, then we build to thirty seconds, then a full minute. When the children can stay still and silent for close to a minute, I will get out the one minute sand timer and they will watch in rapt attention while it empties. When we reach a full minute, they are so proud and excited. Montessori said it was a way to test the children’s will power. She found that their will power grew as the game was repeated and the periods of silence grew longer. In my own class last year, it became a competition. The children wanted to set a goal and see how long they could sit in silence. In December, when we had reached a full minute, they decided that our goal should be eight minutes! This was not by my suggestion, this was a goal that they set for themselves, so every day we would play. The time would increase little by little as the year went on. Sure enough, by spring break we had made it to six full minutes. Believe it or not, my class of eighteen Primary students (ages 3-6) sat in silence for eight minutes by the end of the school year. I think we can all agree that the world we live in increasingly lacks silence. Giving children the ability to choose silence and seek mindfulness is important and empowering. Showing these young children that they can control their body and quiet their mind will serve them well in myriad ways as they grow and develop. I think all of us can learn a bit about will power and determination from these beautiful souls. They never cease to amaze me! This photo popped up in my Facebook feed a week ago. It was taken at “Arts Night” in 2016. It’s a great photo showing my temporary art gallery full of the beautiful projects LifeSong students had completed in art class over the school year. It was a successful event. Everyone loved seeing the artwork displayed on the walls and socializing with other parents. The kids were delighted with their parents’ reactions and of course, the food. I received lots of compliments from families and teachers, recognizing the work I put into the event. As impressive as Arts Night was, this photo reminded me of why it wasn’t. Art, in the Montessori school where I started out as an assistant, was a “special”. A one hour class, taught once a week by an art teacher who came into the classroom and presented a project that all of the students were expected to complete in one or two classes. When LifeSong began, I followed this model. With a lesson every week, we were cranking out so many beautiful pieces that I suggested an event to show them off at the end of the year. It’s while setting up Arts Night with my students the first year that I heard it. Talking as they helped me hang pictures, a few of the children were quick to compare their work with that of the other students and felt that their work wasn’t good. Several other students found fun in pointing out the “mistakes” in the work of their classmates. It was easy to compare when the projects were the same for each student. The art class itself, I was noticing, was problematic, from the students that lacked the skills to complete the project independently as instructed, to the rush to complete the project in just one hour. Some students, frankly, weren’t really interested in the project I was requiring them to complete. Unlike the rest of their Montessori day, they had little to no choices in art class. 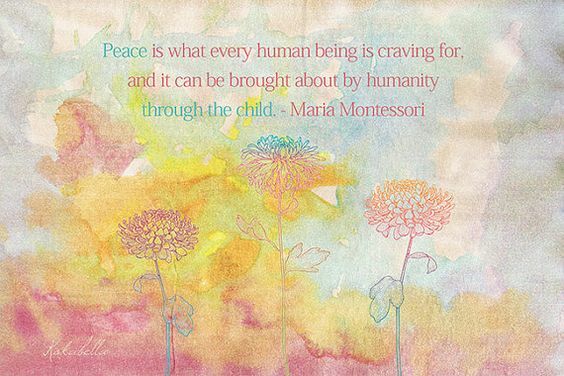 - by Pamela Personette, M.Ed., Montessori Educational Consultant, for Montessori Services. This year, as my responsibilities as art teacher and primary room assistant shifted to that of the lead teacher in the new Upper Elementary room, art would now be guided by the lead teachers in each of their classrooms, in a traditional Montessori approach. In my upper elementary classroom, art and art history are incorporated into the curriculum with special projects and independent studies of art. When studying Ancient Egypt, students chose a project in any medium to visually represent their research topic. As a class we created murals and objects to transform our classroom into a museum full of Egyptian artifacts. After our poetry unit, students designed papers with watercolor paints to highlight their words. The finished pieces were framed and given as Mother’s Day gifts. We even included art in math! When the Twelve Triangles geometry lesson was completed, students used ink to decorate one triangle with a pattern. Color copies of their triangle were made on the copier and the triangles were arranged into a design, forming stars with a varying number of sides. My art shelf is stocked with a variety of materials and the classroom library is stocked with art books to inspire creativity. Students can work on projects every day and complete them when they are able. As their guide, I sometimes model a technique by crafting something for the school or myself and if they show interest in what I am doing, I show them how to do it. In turn, that student will show another interested student. Personally, I loved the pageantry of Arts Night, but this year we are following the children. If you are like me, you are more than ready for the election to be over. I wonder, though, what happens after the election tomorrow. With all of the divisiveness that we have witnessed during this campaign, do any of us really think that our country will come together and support the president-elect? I've been thinking about our students and how we teach them to appreciate diversity, attempt to understand other viewpoints and treat each other with respect. It is so hard to explain what is happening in our country right now to these innocent, impressionable young students. I go to school each day; however, and I witness the beauty of Montessori philosophy at work. Each day we give lessons in grace and courtesy. We start in Primary learning manners, such as waiting our turn, how to let the teacher know you need her without interrupting a lesson, and saying please and thank you. The older children are taught how to greet visitors, answer the phone and take a message. We also learn important lessons on the playground, about getting along with others, resolving conflicts, and appreciating nature. There is so much more to education than academics. We focus on the whole child - mind, body and spirit. We strive to guide students to become thoughtful, hard-working, respectful, responsible, kind adults. We nurture their independence. We allow them to fail, and help them learn from mistakes. Don't get me wrong, they DO make mistakes, we don't always all get along, there are disagreements and tears (sometimes on a daily basis). The difference is that instead of blaming each other or deciding we can't get along, we work through things. We talk about our feelings. The children learn that it is okay to be angry, frustrated or sad. They also learn healthy, positive ways to deal with uncomfortable feelings. We practice showing sympathy and empathy. We learn about peace. We practice resolving conflicts peacefully. We give them tools. We model the behavior we wish to see. When we make mistakes, we admit it. We try again. I love watching the kids spontaneously clean up a spill, offer to hug a crying friend, or resolve a misunderstanding on their own. I enjoy seeing them make a mistake and then realizing next time how to do it better without my help. So, Wednesday morning when it's all over, I will happily go to school and keep doing what I do to impact the future of our country. I am incredibly thankful for our school and these kids. I pray that they retain their positive outlook and commitment to their ideals. God bless America! ​With the looming presidential election, our class of Lower Elementary studies join our Upper Elementary class each day to discuss some of the issues. We generally speak about them in kid friendly terms, although they amaze me at how deeply they truly understand. Today’s focus was on the military. Should women be in combat? Should we invest more money in our military? Should we send troops overseas to fight ISIS? Everyone has an opinion. They discuss the pros and cons of each situation. Someone relates war allies to the alliance he feels toward his buddy on the playground. This puts a new spin on the idea of helping in another country. War is not just a foreign concept anymore. A hush falls over the room. Teachers and students nod in agreement. Well said, my friend. I was invited to speak at a local civic club to talk about Montessori education today. I enjoy these opportunities, but I am always faced with a dilemma where do I start? How do I keep it concise? How can I explain in 15 minutes this wonderful journey that I have been on for almost 12 years now? What are the most important and meaningful aspects to share? How can I intrigue them enough to want to visit the school? Just yesterday I read an article that articulated all of these things so well. You can find it here: https://www.diygenius.com/the-montessori-method-creating-innovators/. The author, Kyle Pearce, makes a compelling argument for Montessori education, asserting that many of the tenets of the Montessori philosophy encourage students to be more creative and innovative in their thinking. It seems that I am constantly reading articles about our struggling public education system. I think Kyle hits the nail on the head when he notes, “failure is discouraged and conformity is encouraged”. I hear this from so many parents that are looking for a different environment for their children. Don’t we learn more from our failures? Does the correct answer on a standardized test ensure success? Furthermore, individuality should be celebrated. Doesn’t every parent want their child to discover their passion? Don’t we all want to encourage and nurture the characteristics and talents that make our individual children unique? That is the difference in a Montessori school. Each child is valued for their distinct contribution. They are urged to question what’s going on, look for solutions, try, fail, learn from their mistakes and try again. There may be more than one correct answer to a question, or way of approaching a problem. There is not always one ‘right’ way. We encourage independent thinking. If you want your child to be creative, adaptable and self-motivated, consider a Montessori education. Visit LifeSong. We have an open house Thursday night from 5-7 pm. Come and see for yourself. We would love to share Montessori with you. Please join us! Graduation is tomorrow. And the last day of school. This time of year is always bittersweet. It is an ending, but also a new beginning. It is hard to watch these little children that you shared three years with move on. But that is the purpose of education - to prepare us for the next phase, a new chapter. They beam with pride on that stage and they are so proud to be 'big kids', to move on to the next plane of development. We will have a new Upper Elementary class next year. After four years of a combined Elementary class, we have grown enough to split into the traditional three year cycle of Lower Elementary and Upper Elementary. It is exciting to be a part of. We started our Elementary program four years ago with five students. We will have twelve in Lower Elementary next year and six in Upper Elementary. We are growing. 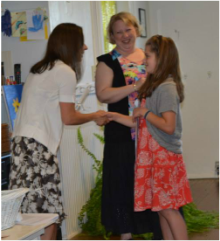 Last year, we had our first graduation ceremony with children completing each cycle, Kindergarten, third grade and sixth grade. This year, we outgrew our classroom space and will be holding graduation in the auditorium next door. We are growing. The children are thriving. My heart is full. We are blessed and God is good. Look ahead with us. Our future is bright! A new classroom will emerge this fall at LifeSong Montessori as the third-year class completes their last lower elementary year. In the new upper elementary classroom, the Montessori materials start to give way to larger, hands-on projects that encompass many areas of study and we are so excited! In the last two years of her life, Maria Montessori wrote curriculum for the elementary and middle school years. Her “Five Great Lessons”, presented to the students over their three years in the lower elementary classroom, are stories designed to engaged students and spark curiosity and wonder. The upper elementary classes, in further exploration of this “Cosmic Curriculum”, discover a much bigger world and are able to choose their own paths of more detailed study. Much like the project-based curriculum of STEAM schools, we will be exploring the Montessori lessons through science, technology, engineering, art, and math. Robotics, computer coding, woodworking, puppetry, textile crafts, cooking, and gardening are several of the projects we will tackle in upper elementary. As Dr. Suess tells us in his book, with the brains in our head, and the feet in our shoes, we can steer ourselves any direction we choose. ​I beamed with pride as Jack led me around his classroom, showing me his favorite work, pointing out his art hanging on the walls. He showed me how he cleans off the table after lunch, gave me a brief lesson on using a hand-loom and brought me up to speed on how ant colonies thrive. Then he took me outside and showed me the compost bin, the garden and how he’s mastered leaping from the top of the monkey bars. This is Montessori. This is what happens when a child learns in an environment that encourages individuality and critical thinking and exploration, teaches them to respect limits, as well as test them. It wasn’t always like this though. In the 7.5 years that Jack has spent on this earth, he has always been my imaginator, my dreamer, my genius. From the time he was a baby, we could tell he was always thinking, observing, learning. He was always different, a characteristic I relish in him. But at no point was his individuality - and the importance of him being free to express it - more glaringly apparent than when he first started preschool at a local church. Expected to sit still inside all day at 3 years old, with no more than 20 minutes to enjoy the Southern California sunshine, no free time to explore his interests and a teacher who couldn’t make sense of his constant compulsion to move left him frustrated and rebellious, and me anxious and disappointed, wondering where I was going wrong as a mother. Then I happened upon an article about how today’s schools are basically setting up our boys for failure. Boys are tactile learners who benefit from hands-on experience and physical activity and taking chances and space in which to stretch their imaginations and explore. Modern-day schools are essentially ignoring thousands of years of innate male biology by requiring them to sit still for hours at a time, cutting down on (or eliminating entirely) their daily physical activity, expecting them to master language- and reading-based skills as early and quickly as their female classmates, tasking them only with lessons that require sedentary focus and hours of nightly homework that preclude them even further from getting any free time outside. I had a moment of clarity. The clouds parted. Jack wasn’t a bad seed, and I wasn’t a failed mother. We just needed to find a school that fit him, not force him to conform to a system that ultimately fails to address his needs. Allow me to show you the “real” Montessori, and exactly what it has to offer to our children. A central tenet of Montessori is fostering a child’s independence - independence in doing things for themselves, independence in being free to explore, independence in pursuing their interests and passions. Montessori students still learn everything they need to know to compete academically, but in such a way that they’re not simply filling in worksheets and going through the motions. They’re learning in a way that excites them, that piques their curiosity, that compels them to discover more. Math isn’t simply abstract numbers on a page; it’s strings of golden beads they can see and touch. Geography isn’t just memorizing the capitols of places they’ll never see; it’s puzzles of the world and in-depth immersion in other cultures through activities like International Night. Handwriting isn’t simply a myriad of lined worksheets where children write letters over and over; it’s sandpaper letters that compel them to touch and trace with their little fingers, inadvertently committing the motion to memory. Science isn’t just reading from a textbook; it’s watching food scraps come full-circle as they turn into rich compost, and nurturing a seedling into a plant. And on top of all that, they’re learning practical skills they’ll use on a daily basis throughout their lives, skills that will ensure they’re responsible, well-rounded, conscientious and capable members of society. The school-snack program teaches Jack about meal-planning, healthy food choices, budgeting and grocery shopping when he has to work with his class to plan out the weekly menu, calculate the money allotment and shop for the groceries. He knows from his class-garden experience how to grow his own food, from seed to plant. He knows that if he finishes his required work for the week, he earns free time, a level of responsibility that encourages independence and teaches him about time management. He and his classmates don’t have issues with bullying, because they’re all too busy learning about compassion for all living things through caring for their class pets. Jack has discovered through his classroom looming that he has a talent for weaving, and he looks forward to learning to sew. At home, he cleans up his dishes after each meal and sweeps up the floor beneath his seat, because his teachers expect no less of him at school. At the age of 6, he gained invaluable experience in what it takes to run a company, as he and his classmates built a lemonade-stand business from the ground up. In a few years, he’ll take his work experience one step further by participating in the adolescent-class internship program. Montessori classes are grouped in such a way that older kids are learning side-by-side with younger kids, instilling empathy, patience and confidence in those acting as role models, while providing guidance and leadership for the more inexperienced students. Montessori works for Jack because it allows him to express and nurture the quirks and characteristics that make him Jack, challenging and fulfilling him in ways conventional school could not. He’s encouraged to stand out and ask questions and forge his own path through critical thinking and creativity. Can you imagine the kind of world we could create for future generations if all of our schools adopted these principles?? Jack is excited to go to school each day, and I have the privilege of watching my precious first-born son blossom into the young man he wants to be, all because Montessori has given him the space to spread his wings, so that he may teach himself to fly.